Yes, you have a good memory my friend. Our going on this vacation was entirely the result of my awesome parents, who decided they wanted to take their grandkids to the House of Mouse for a week of fun. 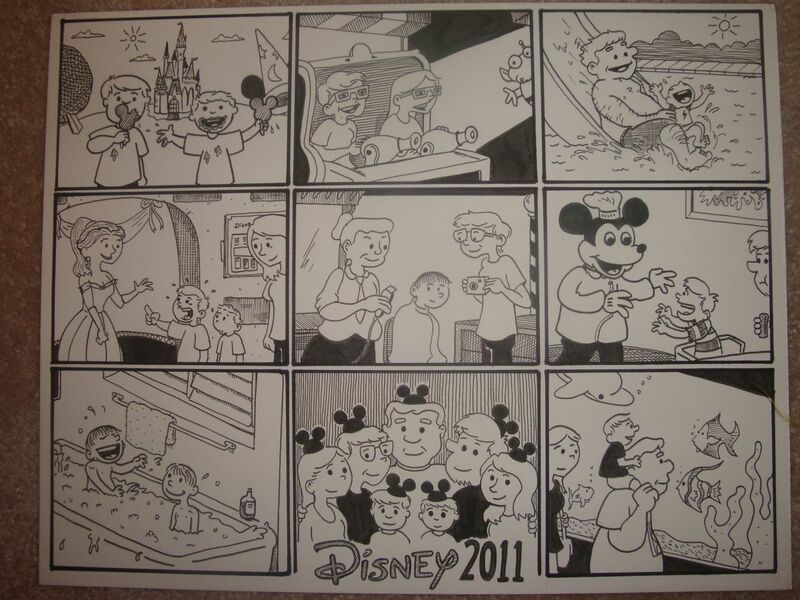 If your memory is THAT sharp, you may also remember that while I was posting journal comics about my family over the summer, I eschewed any strips about the trip. At the time I put it off to laziness. In actuality, I had decided I wanted to condense our trip into one, big mosaic comic I would gift my parents this Christmas. I was working MUCH bigger than usual with this comic, which was a lot of fun. Most of my comics are done on 8.5 x 11 inch Bristol, the easier to accommodate my chintzy scanner. Here, I was working with 11 x 14 inch paper. Behind the cut, I took some closer pictures of my favorite panels. As anyone who teaches high school in Ohio knows, this is a BIG week. With only five school days before the Ohio Graduation Tests, I’m going to take a slight breather from comick-ing. I expect to be back with comics next Monday when the OGTs begin, which might sound strange until you realize that drawing is practically the only thing I CAN do during the test, besides read the newspaper. There’s a lot of pressure on myself and my fellow teachers. I feel like I’ve done my best, considering some of the constraints we are under… but as an educator, I’m always going to find it hard to put ALL my eggs in the “standardized test” basket. It’s frustrating, but I suppose it’s something I’m going to have to get used to if I plan on being in this career for the long-term. At any rate, thanks for your patience. One thing: I’ve sent e-mails to anyone and everyone who thoughtfully donated back during my “I’m broke” fund drive. If you tossed me some shekels and you want a drawing, let me know! 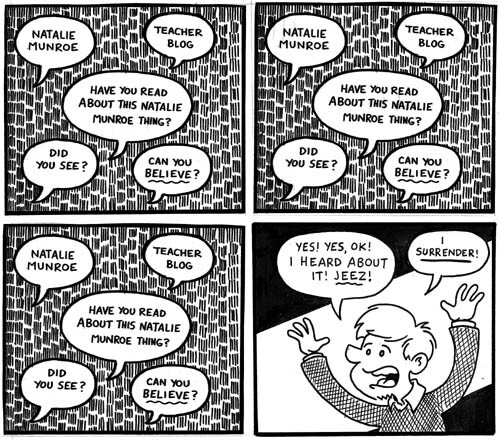 Oh man you guys, as a teacher who blogs (even in a non-traditional sort of way) I have been OVERRUN with questions about Natalie Munroe. I am Natalie Munroed OUT. Munroe is the teacher who came into the public eye this week for writing blog posts about her students wherein she included statements about their lack of prowess both academically and socially. Her blog posts came to the attention of her school’s administration and she was suspended. Hey, have you heard about the New Engand Comic Arts in the Classroom Conference (NECAC)? If you haven’t, you should click here. The website does a FAR better job than I would describing the event. Everyone here knows what a huge proponent I am about getting comics in the classroom, especially for those lower level reluctant high school readers. The NECAC looks like an amazing step in that direction… and look! Among the many special guests is Rania Telgemeier, author of my favorite graphic novel of 2010, Smile! You must go! I mean… I cannot go, because I live out here in Ohio and I’ll be working… but YOU! You must go! I should also selfishly mention that the NECAC is putting together an anthology of comics about teaching and learning titled “Show and Tell” that you can support through their KickStarter project. It looks like a worthy publication and you should definitely check it out. I may be contributing some of my journal comics, which would be the first time they’ve seen print anywhere beyond a Xerox machine. Much has already been said about the controversial decision of NewSouth Books’ decision to edit Mark Twain’s The Adventures of Tom Sawyer and Huckleberry Finn for modern audiences by removing words that are perceived derogatory by today’s standards. Or, I should say, a modern YOUNG audience, as this book purports to be for teachers use in an effort to avoid some of the derogatory racial language used by Twain. I don’t agree with NewSouth’s editing choices, but it also doesn’t bother me much as it seems to bother the majority of people I’ve encountered on the Internet. I have quite a bit of faith in people’s B.S. detectors and simply cannot imagine this re-edited version getting much of a foothold. The original Huck Finn has stood the test of time so far and no matter what a bunch of attention-seeking editors do to it, Huck Finn will continue to stand. Even as an educator for whom this book may be intended for use, I think the editing is a stupid idea… but like most stupid ideas, it will go away when people stop paying attention to it. I will point you to this VERY funny edition of Ruben Bolling’s Tom the Dancing Bug for some commentary on the ridiculousness inherent in needlessly changing classic stories to reflect modern sensibilities. Ruben says it better than I ever could. I’ve always felt that Tom the Dancing Bug is one of those comics that should get a lot more attention than it seemingly does, as it’s terrific. I would LOVE to be able to buy a nice collection of all of Bolling’s “Louis Maltby” strips in one volume. Normally this is where I do some kind of book/comic/movie/TV recommendation, but I haven’t been consuming a whole lot of stuff lately. I’ve yet to start on any of the books gifted to me over the holidays, I haven’t seen any movies to speak of and television is largely in reruns. I did finally see Inception last week and had about the same reaction as most folks- I enjoyed it immensely and half of the time had no idea what was going on. Thomas Hardy was the stand-out in an already stellar cast and if you haven’t seen it, you should… but I believe my wife and I were the last two people in America NOT to have seen Inception, so that’s not much of a recommendation. Sorry! I’ll do better next week. I love comics and although I am perfectly fine with Elliot and Henry having no interest in the medium whatsoever, I’ve been trying to build a healthy interest in them. Well, more with Elliot than Henry at this point, I suppose, but the fact remains: I would love for them to also love the things I love. To that end, in the past few months, Elliot and I have been reading lots of comics together. Although I’m never sure exactly how much he’s following the panels and pictures, he enjoys the stories and it’s been fun introducing him to some of my favorites, both new and old. I’ve been well pleased with the sheer amount of children’s comics that we have to choose from at our library- when I was a young’un, comics were all but absent from libraries. Now they’re some of the biggest sections of the children’s areas. From L to R: Sasspants, Johnny Boo, Squiggle. Full disclosure: The first character comes from the children’s comic Guinea Pig: Private Eye, which is written by my friend Colleen Venable. Colleen and I went to high school together and she was super-nice to me when I moved to Brooklyn in 2006. If you know Colleen, you will not be surprised to see her name appear in the same sentence as the adjective “super-nice”. She’s one of the nicest people I’ve ever had the good pleasure to meet in my life… which makes it all the easier to say that Guinea Pig: PI is awesome and Elliot loves it. It has a really clever premise, (Sasspants is a “P.I.” because the “g” fell off her cage’s sign), a lot of good humor, and some wonderfully cute art from Stephanie Yue, who also colored the heck out of my favorite graphic novel from 2010, Smile. Also awesome: Colleen was doing a signing back home in New York a few weeks ago and I sent my mom to pick up both Guinea Pig: PI books (Hamster and Cheese and And Then There Were Gnomes, with others to soon follow for those playing at home) and she was nice enough to sign the books. This in and of itself would be awesome, but I have to publicly thank Colleen for signing one of the books “To Elliot and Henry” and the other “To Henry and Elliot.” That kind of attention to possible future sibling rivalry is most appreciated, Colleen! Johnny Boo is the main character in a series of children’s comic books by cartoonist James Kochalka. I’m a tremendous fan of his and it’s impossible to argue that he’s the epicenter for “one a day, everyday” journal comics. We picked up Johnny Boo and the Happy Apples, the third book in the series, at our library. 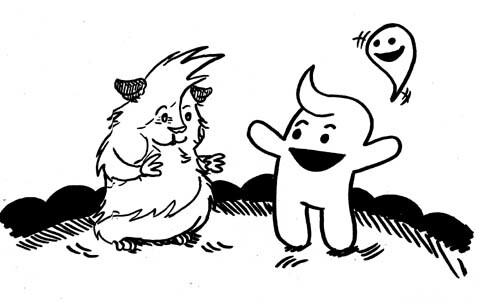 Elliot’s very into monsters and ghosts and Happy features both- besides Johnny and his pet ghost Squiggle, there’s an Ice Cream Monster. Elliot digs reading these and repeating many of the “catchphrases” that the characters use like when Squggle yells “Squiggle power, ACTIVATE!” That’s become a resounding cry in our house as of late. Anyhow, I highly recommend both of these books. Tomorrow I’ll give a second recommendation to a great children’s/comic book with some cool art. no chalkboard photo post this week! Sorry folks! Over the weekend, I got a brand new cellphone to replace my seriously busted Verizon Voyager. I like the new phone, but I forgot to import all of this week’s chalkboard photos over to the new phone. This is yet another indication that the holidays have started in full force. As of this afternoon, I have no comics drawn for the upcoming week. I have a few sketched out, but none are inked or lettered. Given this fact, I haven’t decided if I’m going to take the week off or not. If memory serves, I took a week or two off around the holidays last year… but I was also about ten comics ahead of where I currently stand in the 2010-2011 school year. Eh, I’ll let you know tomorrow. 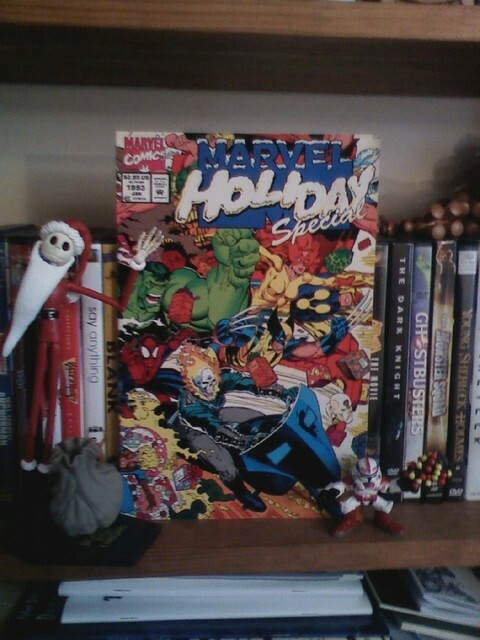 Today we’re looking at The Marvel Holiday Special from 1992. 1992 was one of the first Christmases where I had saved my own money to buy people presents. I bought my father a sci-fi paperback titled The Price of the Stars from the Waldenbooks in the Newburgh Mall. I chose that book as a present for Dad based entirely on the cover of the book, which had a lady in some kind of space-pirate outfit, replete with eyepatch. I guarantee Dad never read that book, but I can at least say that my other purchase went to good use, as I picked up this comic for myself. Adorned in a truly excellent Art Adams cover, the Marvel Holiday Special contains eighty pages of original holiday themed stories featuring Marvel’s best and brightest superheroes. As I grew older and into a more jaded comics reader, I gradually came to the realization that most of the annuals that Marvel put out in the 1990’s seemed to consist of stories they’d had sitting in a dusty drawer somewhere for ten years. Annuals were where younger new artists and writers were given a chance to prove themselves… which as a practice is great for the novice, but not always fun for the reader.